There has been some change of plans regarding our vacation to the Philippines because of my school. I think it will work out better this way so that I can have time to earn some extra income for travel expense as I wait for another year. There is really a need to replenish since I have used some of my money for school. I am looking at this specialty merchandise corporation, a company that will help you start a small business where you are able to purchase products at a low price and resell them for profit. I think I am good at reselling but when you talk about selling products to others, you need money up front to be able to buy the products you will sell. Who do you think is generous enough to give me the money? Although, smc is saying that all you need to start is just an smc membership, I want to learn more about its ins and outs and check smc corp bbb rating. Hope I find good reviews and feedback that would be helpful to my plans. 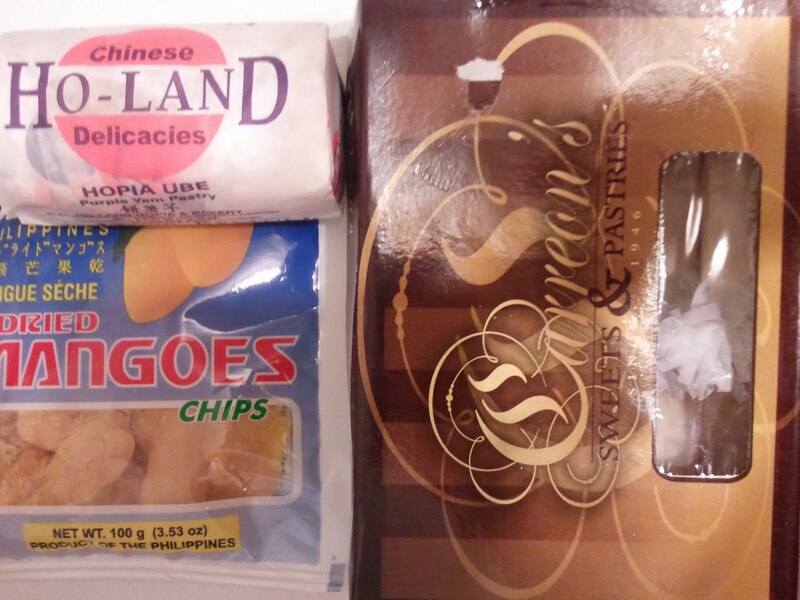 When i got home yesterday, i saw more philippine goodies at the dining table. 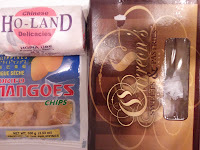 My favorite dried mangoes from cebu, holand hopia in different flavors (my favorites are ube and mongo) and box of pastillas from carreon's sweets and pastries in pampanga. Thanks again to the sponsors. Since it has been raining for the past weeks, I figured it is about time to buy a rain boots. I know too that April is a rainy month, wearing rain boots will definitely be both a necessity and a fashion. Mind you, it took me three weeks to finally decide which boots I really wanted. At a certain point, I have three boxes of rain boots and a stuart weitzman shoes in my car but I ended up returning them all and got a different one. All the shoes are knee boots and wearing a high boots is not really comfortable for a petite person like me. I am fine with soft leather tall boots but not with plastic rain boots. I finally found a boots that I really liked. I was reading a women’s shoe blog and she was talking about how comfortable hunter boots are. When I look at the website, hunter has tall and mid calf boots. Immediately I went to the mall to try but they do not have my size. I ordered it online when I got home and it is expected to arrive by Thursday. This is good because I heard it is going to snow/rain this Saturday. What! 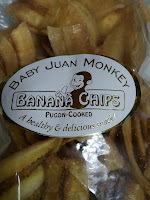 I'm munching on some banana chips from philippines. The taste is so much different from the one i buy from the oriental store here. 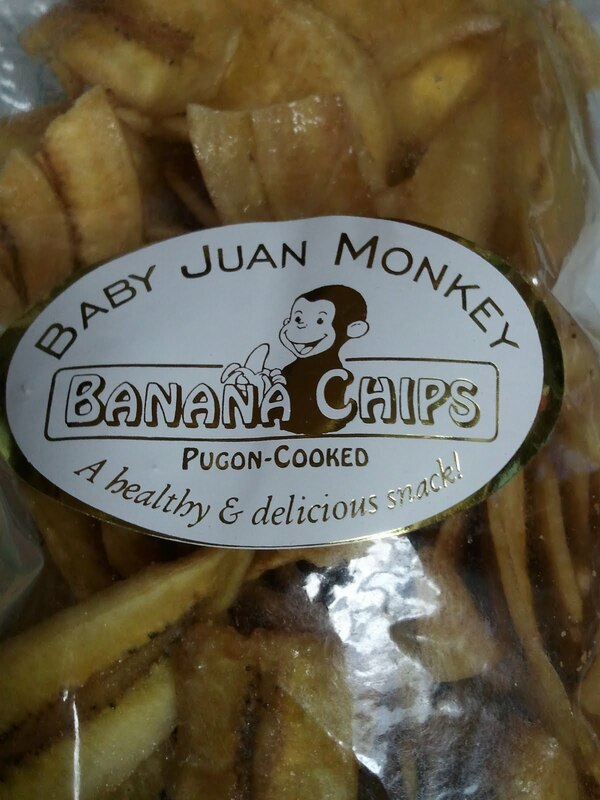 The brand is baby juan monkey, pugon cooked banana chips. I think i can finish this whole bag. Thanks ateng for this one. I had the biggest scare last weekend on my computer. Remember, I just bought a new notebook replacing my old one because there was something with the motherboard per the technician who diagnosed it. At first, the power just went off. Thinking that the problem was the power supply, I bought a new one but still nothing happened. When I took it to the technician, he told me that I will be spending around $300 to fix it. I made a decision to buy a new one instead. I added $200 more, I was able to get a better notebook with free anti malware software. As I was telling you about last weekend, I was using this new computer and all of a sudden I got a message about a virus attack. I thought it was a legitimate update but when I clicked it, I just saw bars downloading some files on my computer. I immediately shut it off, waited for a few minutes and turn it back on. Thankfully, I was able to do it, then reboot my computer to a later date, run the anti malware and anti virus several times. I found 3 infected files and was able to get rid all of them. My notebook is virus free now. I can say that it really pays to keep all your anti malaware and virus protection softwares current and updated all the time. Sometimes viruses come as a legitimate email or updates, so be careful in clicking those things. If you don't know the sender, just ignore them. It's 11:36 p.m., just came home from picking up somebody from philippines at jfk airport, nyc. i'll catch up tomorrow. enjoy your evening guys. good night! During lunch break, I saw my co-worker warming up in the microwave some spaghetti with meatballs. It looked so good that when I went back to my desk, I found myself looking for a spaghetti recipe online. I want the Italian style spaghetti, not our own sweet spaghetti. I know I have a pack of sausage in my freezer that I can use but I need to buy some basil and dried parsley leaves. I remember I just cleaned my wall spice rack so I know what is missing there. I had plans of another spice rack but hubby objected to it and suggested that we just get a bigger one instead of having two kitchen spice racks. He was right, why put two spice racks when a bigger one can fit to save space? So, as I was saying about my spaghetti, I bought the spices I needed then cook it last night. Now, I have sausage spaghetti for lunch. I made a lot of sauce which I think I can use it for lasagna this weekend. I put the spaghetti sauce in several containers to be kept in the freezer. I will just thaw each container as needed. This saves me from not cooking several dinners when I get home from work. First time for me to see some mangoes at the fresh market this year. 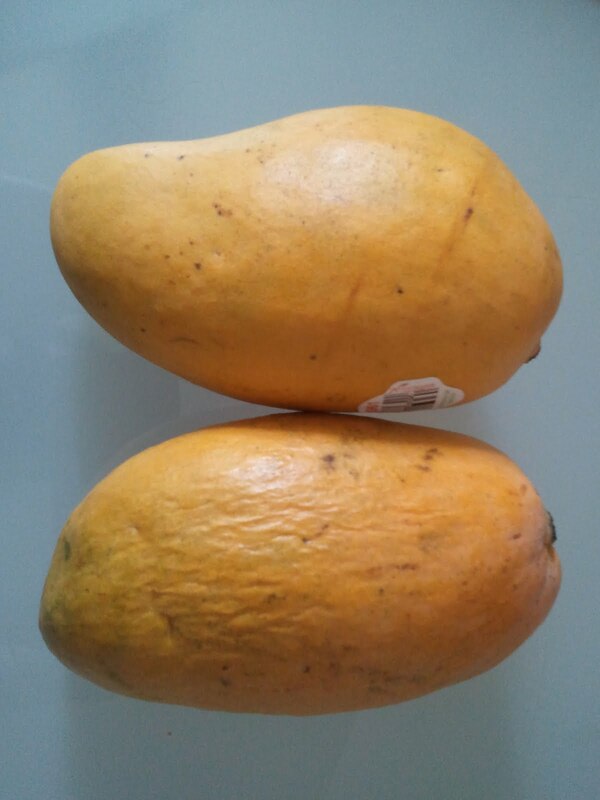 The green mangoes are available all year round at the supermarket but these yellow ones are only during summer time. I normally buy them by box at the oriental/filipino store but yesterday i saw some at the fresh market. It is being sold by piece at .99 cents. So i decided to give it a try. (the picture shows a day old mango). When we first tried the mango, it was SOUR but now i think i looks better after a day. Hay, how i miss the mangoes back home, super sweet and so yeelloooowwww! I am checking my bank statement if the webhosting company has charge me for the renewal fee of my website. I knew it is due sometime this month. The web hosting company already sent me an email few months back reminding me of the due but I think I accidentally deleted that email. I cannot find it anymore in my mailbox. I have no plans of changing my web site hosting company. Their service is above my expectations and I will definitely recommend their services to any of my friends who have blogs too. I did my homework before signing up for a web host. It was through http://www.webhostingrating.com that I was able to make a comparison and check the reviews, ratings and fees of various host companies. Right now you can check the 2011 Best 10 cheap web hosting services. Get one that meet your needs so that you will be happy with the services that you get. 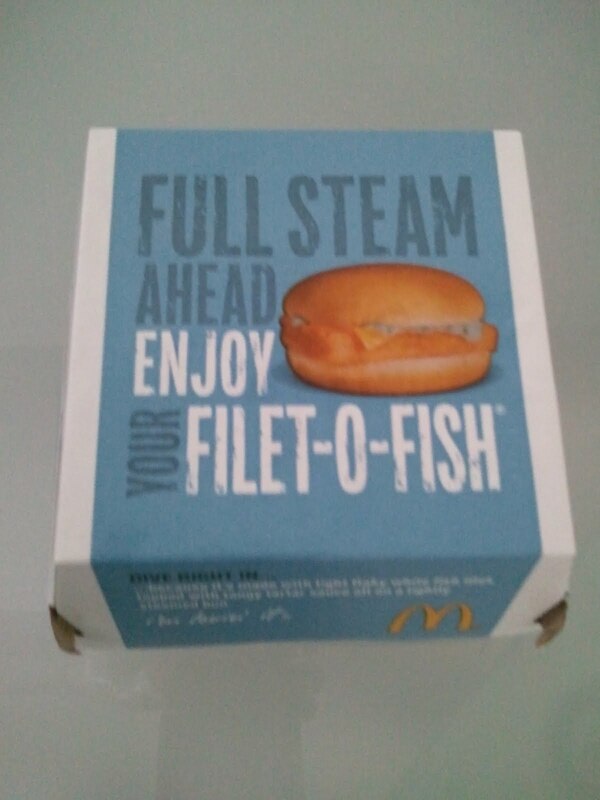 Because it's friday and also the lent season, i tried to avoid meat during fridays. 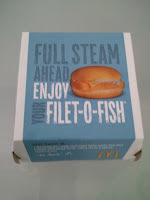 So, I had this fillet o fish sandwich for lunch. It has been my favorite anyway, lent or no lent so i don't mind having it. And, here's a good deal, it's 2 for $3 right now. When I pick up my daughter from school last Friday, right away when I saw her face, I know there was something wrong. I saw a worried face, like “I hope mommy will not get mad at me,” face. As soon as she got into the car, she told me that she lost her wallet. My instant reaction, “was she able to eat lunch?” because that’s her lunch money. She said, yes, the lady at the cafeteria knew that she lost her wallet. My daughter does not know where she dropped it, either at the cafeteria, her classroom or at the kids lockers. The school has no lockers for kids like the first graders yet but the childrens lockers are just at the corridor so she still goes there. Hope somebody finds it and return the wallet to her class. Her name is in there but no teacher’s name. So I bought her another wallet yesterday. It is a bigger one and has a zip closure and I put her name in bold letters with my phone number. So far she has been responsible for all her school stuffs and this is the first time that happens. Let’s see how long this new wallet lasts. Because we went to Costco after coming from work (around 6pm), so we just decided to buy the chicken wrap, pizza and caesar salad from there for our dinner. The caesar salad was big enough for us with huge slices of chicken breast. I tell you, the best time to go to Costco is during weekdays, less crowd, no line at the cashier and easy to get a parking. If you are curious how much gas at Costco (I'm from North Jersey) right now, it's $3.25. So that's it for a quick update. Later. At last, I am done with the first two weeks of my class. It was quite an adjustment for me who has been out of school for about a decade now. The school load was a bit overwhelming at first but I was able to do it. The first two weeks involve the first 6 chapters in our textbook; full of readings, assignments and quizzes. We were already warned by our professor on the first day that the first 6 chapters needs a lot of attention but once done, they rest of the chapters would be a breeze. He was right and he left us a note yesterday that when we are done with our work to give ourselves a tap on the shoulders for a job well done. And, I just did that to myself. Today, we are about to begin a very interesting subject to me. It is about hypertension and high blood pressure causes. This is something I can relate based on personal experiences with relatives and friends. None of my family members has high blood pressure problems but to be more aware on its causes and how to prevent it would be very helpful. I know there are more interesting topics as we go along with the subject. I want to join Groupon! I just finished making reservations for our vacation in Florida. Instead of going to Philippines, we decided to go local this year. And also, we think that our daughter is at the age that she will enjoy Disney world. Every time she sees the commercial on TV about Disney, she keeps on asking when we are going there to see Mickey Mouse. It would surely be an unforgettable experience for her – her first trip to Disney. Mom's first trip to disney was when i was 30 years old!!! Speaking of Florida, does anybody who lives down South is in need of an audiology? If you are, you can visit South Florida Audiology associates located in Broward and Palm Beach County. They have certified doctors of audiology for children and adults, specializing in all aspects of hearing health. If you are interested and wants more information, please visit http://www.audiologysouthflorida.com or call 954-752-1559 at their Broward office or 561-353-9988 at their Palm Beach County office. You can also directly to their website and schedule your hearing evaluation. Yehey, i got my girl scout cookies today. I ordered them from the wife of my co-worker and she delivered them to work. I only ordered the Trefoils old fashioned short bread and Lemon Chalet creme or lemon sandwich cookies. I know there more flavors, but these are my favs. It can be so hard for me to pay attention to what's going on during lectures because I get really distracted by other people and in any given college class half the people are on Facebook on their laptops when they're supposed to be taking notes. Then a quarter of them are texting to other people. So it can be really tough to concentrate on what the professor is saying to get down all the stuff in my notes that may appear on the test. I thought that maybe this semester I should turn a new leaf in my note taking for classes and tried to look up tips on how to take better notes. While I was looking online for that stuff I came across some Harrisburg clear 4g internet packages and after I read some about them I decided to change over my internet service at my apartment to it. I found some note taking tips online that I'm going to use this semester. It's just now starting so we'll see if I can start this good note taking habit. Is this deal still good at mcdonalds? I just saw this photo while i was deleting some pictures on my phone. I took this picture about a month ago. I'm just wondering if any size coffee is still a buck. Maybe, i can stop by in the morning to check. I love mcdonalds coffee. I have been shopping for some anti-aging products for my skin. You know, when you reach the age of 40 and up, your skin needs to be revitalized to regain that glow and look a bit younger. Lucky are those people who still maintain their younger looking skin even without the need of any anti-aging products. With just proper cleaning and moisturizer they are fine. Not my skin. I am not surprised because during my teenage years I already have problems with pimples and acne. Now, that I am grown, those pimples are gone but I start to see signs of aging on my face. I want the dark spots, fine lines and wrinkles to disappear, if not, just to minimize them without spending too much on the budget. My friend told me about resurgence, a product by murad where you can have radiant skin in a matter of 4 weeks. I am interested with these products. I have read some of the stories of women who have used resurgence and I think I want to give it a try. I am just waiting for my friend to email me the murad coupon codes to avail of their promotional offer. So ladies, if you want to give it a try too, visit http://www.resurgence.com or http://www.acnecomplex.com to get more information about this product. I am excited to try this very soon. for late lunch, we went to KFC. We got.. There were still a lot of chicken for home. Am I Getting A Student Loan? It has been a very busy two weeks for me since I started school again. So far everything is going fine; just wishing for more hours in a day sometimes. I liked my student life a lot. Actually, I am ready to enroll for more credits starting next month. Being in school is not cheap at all. This is the reason why student loans are being offered by a lot of institutions. I have plans of applying for a student loan but I still have to check what my credit score is. If there is a free interest student loan, that would be great but there is nothing like that. I can still afford my school expenses now but I get a lot of student loan applications in the mail with free credit score report but I am not decided yet. I do not want to be in debt by the time I finish school. If i decide to get one in the future, hopefully i can find a loan with the lowest interest rate available. 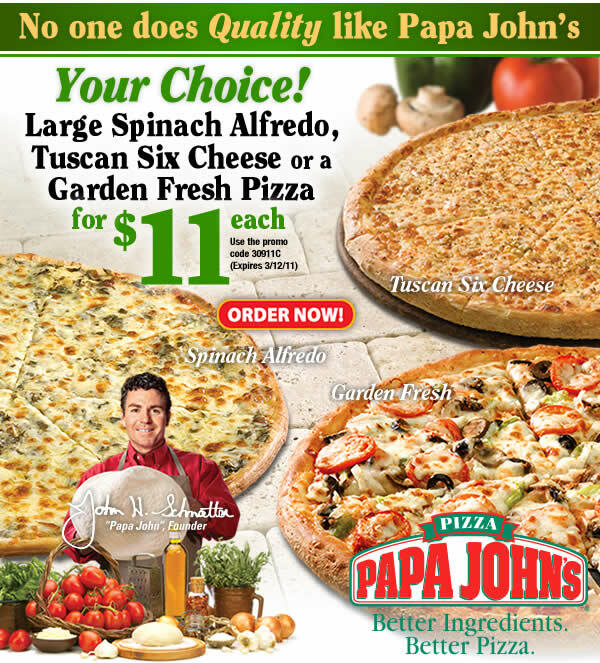 Just got this email from papa john's about their spinach alfredo, tuscan six cheese and garden fresh pizza - these are all perfect for the lent season. The spinach alfredo looks good.... hmmm, i feel hungry now. Maybe we can have this for tomorrow (friday) night. The town where I work is under flood warning starting tonight. Because of too much rain over the weekend, the river started to crest since yesterday. To make the situation worst, more rain is expected to fall from tonight up to tomorrow evening. This is actually a repeat of what happened last year. I remembered getting stuck in traffic trying to get out of the flooded area. It was also the same time when we were busy preparing for our yearly trade show. The hotel that my company rented for the trade show is right by the river so there is a possibility that it will get flooded again. I hope that the hotel’s blomus stainless steel mailboxes have been relocated to a safer area because they have been badly damaged by the flood last year. The stainless steel mailboxes were ok but the structure holding them gave way. I also recalled that there was also another trade show about stainless steel fireplace accessories ongoing that time at the hotel that got canceled because of the flood. If you pass by the river right now, there are emergency trucks on standby and evacuations are on the way. Residents are asked to leave as early as now before the water gets higher and it will be difficult for the authorities to move them. We will play by ear tomorrow if the roads are passable. I am hoping that the rain won’t be that bad. ...because I think I forgot my lunch bag at home. I remembered taking out my lunch from the refrigerator, put it in the bag but I think I forgot to grab the bag on my way out. It's not in my car, so where else it would be but at home. I did not go out to buy lunch because it's pouring outside. So what did I eat? A PBJ...it was good..
Every day when I go to work, I pass around four gas stations. Since the gas prices have been increasing so bad these past days, I always pay attention on the prices these gas stations post. In, short I am doing my own survey before I fill my tank. So today was the day I have to get gas. It was $3.49 per gallon, up by 10 cents from few days ago. I have the van today so it cost me $70 dollars to fill up!!! What happens come summer time then? If I could only trade this van for a new Honda accord or any used Honda for the summer, I would gladly do it. This was our first choice when we walked into the Honda dealer when gas was around $2.25 per gallon but it becomes impractical to be driving this vehicle for 30 miles every day to work. We are already used to higher gas prices during the summer time but I hope it will not be $5.00 per gallon as rumored. Once this happens, all vacation plans will be cancelled or we will just stay local and stay within the budget. A freebie earned by using my panera card. 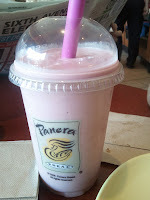 A $4 strawberry smoothie. There will be more freebies to come. Thanks Panera. Does anybody know how much to transport a car from Salt Lake City to NY? I have a nephew who lives in Utah and is moving to upstate New York for schooling. He got accepted in one of the colleges there. He definitely needs a car when he moves upstate so he is asking me as early as now if which one is better, to just sell his used Nissan and buy another used car or bring the car to NY. To drive all the way from Utah is not advisable taking into account the condition of the car. Because he is going to school, spending money to buy a car is not an option and he would not probably be able to sell that to any used car dealer in Utah for a good price anymore. If he is moving to the city itself, having a car is not practical at all but it is different if you live upstate. Summer school is not going to start until May or June, so my nephew still has time to think about different options before he leaves his hometown. I have not seen him for years. I am happy he will be closer to me and be seeing more often when he school starts. It's saturday morning. No work, no school. The daughter wants to make something for breakfast so we opened a cannister of crescent rolls from philsbury. 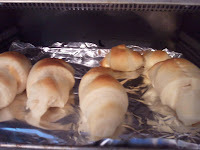 She put some cheese inside and rolled them. Mom's roles are only to put them in the oven and take them out when cook. She did the rest. Now it's cooking and breakfast is ready in a few. I am thankful that this Friday is going to be a light day in terms of work. Although I have to stop by my job to finish my order for more Whitehall products besides the Whitehall mailboxes I already ordered, other than that I am done with my work this week. My boss specifically ordered for wall mounts to be attached right at the front door so that it would be easier to grab the mails even if it is snowing. So that is basically it for my Friday at work. From work, I will to go my school to pick up the book I ordered at the bookstore. It has been pre-ordered and paid so I hope it will be ready by the time I get there. How I wish they could just put your pre ordered book in one of the mailboxes for easy pick up. I know that is not happening so I am just hoping that I get a parking close to the bookstore. From my school, I will go to my daughter’s school to pick her up. She thinks I cannot go because I have a class. She will be surprised to see me later. I had lunch with my Puerto Rican friend at work. No, we did not go out to eat. She told me yesterday that she’s going to let me taste the rotisserie chicken she made at home. So I said, ok, and I will bring the rice. So that’s what we had today. Her chicken was good, with the entire Spanish rub she had on it, it was delicious. She likewise liked the Jasmine rice I brought. She said, it smells good and you can eat it plain. She asked me where we buy it, so I told her at Costco, so she’s going there this weekend and buy some for her house. If she likes our rice, I soooo love their yellow rice too! So this is what we call…when a Boricua and a pinay goes to lunch together! Maybe I forgot to mention that this mommy here has gone back to school. Yes, I did. It has been decades since I left school and now I am back to the thing I used to love. I’ve been wanting to go back long before but my life got busy with work and building a family. It was a promise to myself that one day I will go back to school same time that my daughter starts her full day at school. So I met my professor last Monday. He is a surgeon. He was not wearing a men lab coat but he introduced himself to us as a surgeon who likes to teach. I am not working in a medical field but I could tell from the medical uniforms worn by some of my classmates that they work in hospitals. I like those peaches uniforms they have on. The first part of my course is online but we have to meet our professor at least once every two weeks. By next month, the online course is over and I will be attending my classes two or three times a week. I will be busier but i like it and i'm so happy to be in school again. I'm loving this new thing from mcdonalds. 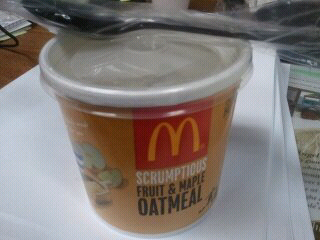 It's the fruit & maple oatmeal. It's oatmeal of course with fresh apple, raisins (w/c I don't like but I take them out) and cranberries. I'm not sure how much to be honest because I have been asking my co-worker to buy it with a coupon. My guess it's a buck something. This is filling and 100% whole grain. Let me eat now. Happy breakfast. Now that spring is almost here, I am keeping all these hanes thermal longsleeve shirts away. Winter is over so we will not be needing them in the next eight months or so. I am planning also to buy more of the fruit of the loom underwear for my daughter’s summer use. I like cotton underwear during summer time because they are light and very soft on the skin. Some of these underwears come in a pack of 12 so I think one pack is good for her. Today it started a little bit chilly that is why I decided to wear my levi 501 jeans with flat shoes. Once the temperature hits mid 40’s, I can sit outside and have my lunch at the steps in front of the office. The little breeze is fine as long as you have your light jacket on. Hope everyone is having a good day. It is quite busy in the office but it keeps my time goes by fast. In a few hours, i am on my way home. 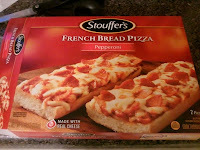 When this went on sale for $1.99 per box, I bought 3 boxes (1 pepperoni and 2 cheese) and just put them in the freezer. Then, I forgot about them. Come Sunday, while looking for something to eat for snack, I found those three boxes at the bottom. Defrost them then put in the oven for a few minutes – enough to melt the cheese and make the French bread a little crunchy. I tell you, they were good. I have to wait ‘til they go on sale again and buy more. 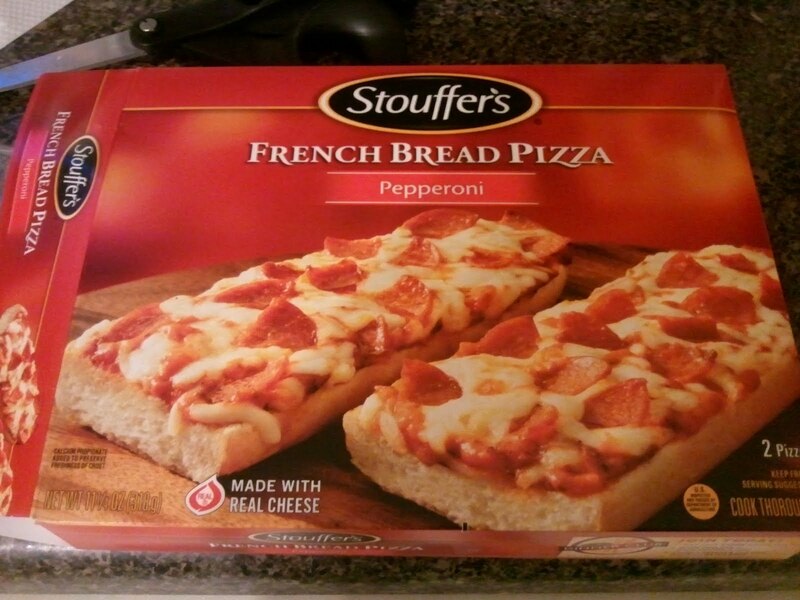 Right now, it’s at 2 for $7 at the supermarket. Regular price of one box is $3.99. I stopped complaining about the weather anymore. It is not because I decided to like winter and snow but it’s getting warmer these days. I can smell the spring air and on the 13th we are changing to daylight savings time already! I cannot believe when my co-worker told me that it’s time to change our clocks in two weeks, then spring starts on the 20th. Yehey! I will start putting away our winter clothes by weekend. It is time to take out from the closet my best body shaper clothes so that I can get on the tracks again and do my running. This reminds me to buy a new bra and cami with cleavage cover. I have one that I bought last summer but I think it shrunk a little bit when I left it at the drier machine for too long. This kind of bra and cami are best worn with your tank tops during warm season. This is the winter where we got the most snow storms. I am so glad that it is almost over now and I would like to welcome spring as early as now! 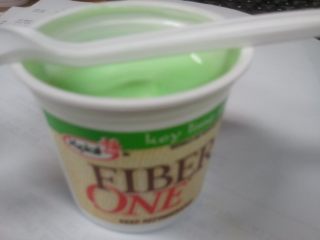 This is my first time have a key lime pie flavor yogurt. I don't really like the taste. This taste is more for ice cream or cakes. I just bought it out of curiosity of how does a key lime pie yogurt would taste. Now that I know, I'm not buying it again. I'll stick to my peach and strawberry yogurts. I am very excited to know that a friend of mine from Philippines is finally coming to the U.S. I said finally because she was much undecided for a long time. She has been a house wife all her life with no previous job experience at all. She knows she has to get a job once she gets here to survive but with no experience she thinks she will not make it. I told her to try going back to school but she is not interested in that too. So I said to her, “Why don’t you just put on your own business?” Oh, it was a delight when I told her that. It means she is interested. I told my friend that somebody has mentioned to me about Specialty Merchandise Corporation, a company that provides business opportunities to people. At smc corp , they have a huge inventory of home decor, collectibles, general gift merchandise and a lot more that SMC members can buy at discounted prices and sell to customers for profit. And, to start with SMC, all you have to do is to register as a member. Once a member, SMC will also provide you with tools and coaching to succeed. I also reminded her to read about the specialty merchandise corporation complaints before she makes her final decision. Let’s see what happens when my friend gets here. At least, there are a lot of options available for her. Thanks for coming. March means Spring is here very soon. In twelve days we are changing to daylight savings time. Then, on the 20th, it is officially Spring time. It's time to say goodbye to winter. 'Til next.